Med-Chemist: Eribulin mesylate drug may help extend lives of women with advanced breast cancer..
Eribulin mesylate drug may help extend lives of women with advanced breast cancer..
We know that, Eribulin (see structure E7389) is an investigational anticancer drug. 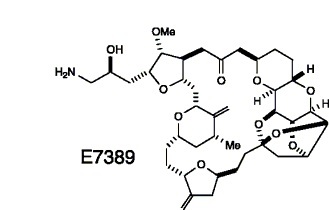 Eribulin was previously known as E7389. Eribulin is currently being investigated by Eisai Co. for the third-line treatment of advanced breast cancer in patients who have been previously treated with anthracyclines, taxanes and capecitabine, as well as a variety of other solid tumors, including non-small cell lung cancer, prostate cancer and sarcoma. Structurally, eribulin is a fully synthetic macrocyclic ketone analogue of the marine sponge natural product halichondrin B a potent mitotic inhibitor with a unique mechanism of action found in the Halichondria genus of sponges. Eribulin is a mechanistically-unique inhibitor of microtubule dynamics, exerting its anticancer effects by triggering apoptosis of cancer cells following prolonged mitotic blockage. A new synthetic route to E7389 was published in 2009. Now research team at the University of Leeds and St James's Institute of Oncology led an international trial of the new chemotherapy drug, eribulin mesylate. As per the claim by the researchers, average survival was typically 25 per cent longer for women who took eribulin mesylate. In the EMBRACE trial, 762 patients with advanced breast cancer received either eribulin or standard cancer treatment. All of the patients had already been heavily treated with conventional therapies, but their disease had returned or spread to other parts of the body. Researchers concluded that those who took the new drug lived for 13.1 months, on average, compared with 10.7 months for those on conventional chemotherapy. The drug was also well-tolerated by most patients. Researchers hope that these results may establish eribulin as a new, effective treatment for women with late-stage metastatic breast cancer (either single drug or in combination with other anticancer drug). The drug is not yet available for routine clinical treatment and is awaiting regulatory approval in the European Union, the US and Japan.